When a Bournemouth theatre looked at putting on an educational play about addiction, the director realised she needed the input of those who had ‘been there’. The venture that emerged, Vita Nova (page 8), completely exceeded expectation, opening doors to engage not only with schoolchildren, but with police and local services. As well as making their mark on the difficult territory of young people’s education, those involved in the group have also had chance to expand their own horizons with educational projects and creative learning – an inspiring example of two-way service user involvement that’s life changing in many respects. Mel had a very different experience of the personal and professional coming together when, as an addiction therapist, he found himself faced with the alcohol-related death of his brother (page 16). The usual family feelingsof helplessness were further magnified by not being able to use his knowledge to stop the clock, and we thank him for sharing such a painful memory. Release’s new executive director, Niamh Eastwood, is featured in our profile interview this month (page 18). You can meet Niamh, Dr Chris Ford (Post-it, page 11), Ken Stringer (page 12), Dr Steve Brinksman (Soapbox, page 23) and others with plenty to say about the vital role of service user involvement, at our conference in Birmingham on 16 February – hope to see you there. 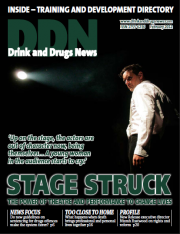 New guidelines on sentencing people for drugs offences are intended to make the system fairer.DDN considers whether they do, and if the press has missed the point – again. Started by a group of ex service users, Vita Nova has performed plays and delivered workshops to more than 100,000 people, including schoolchildren. Ignatius Harling sets the scene. Highly controversial at the time, Martin Blakebrough looks back at 20 years of computerised onsite dispensing at Kaleidoscope’s headquarters. The Alliance has reviewed its structure and purpose in light of a new ‘era of recovery’. Chief executive Ken Stringer gives the thought behind the organisation’s recent changes. The Care Quality Commission has had its share of bad press recently, and is toughening its approach as a result. But, says David Finney, that shouldn’t be cause for despair. Mel Ashton’s role as an addiction therapist couldn’t prepare him for the alcohol-related death of his brother. He describes what happens when the personal meets the professional. Release is well into its fifth decade of advising those caught up in the criminal justice system and advocating for legal reform. David Gilliver talks to new executive director Niamh Eastwood. David Best considers what a genuinely recovery-orientated system of care should look like.